My favorite part of sewing as a business is being able to do custom requests. A customer will see something that sparks interest, but they want something changed. So they email me and we figure out how to make that dream a reality. In this case, the customer wanted a bed runner rag quilt with a matching 16" square throw pillow. 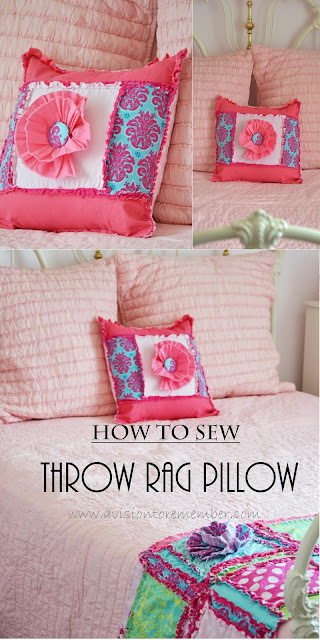 The throw pillow is really simple one to make. left and right side rectangles cut 9"x5"
Top and bottom rectangles cut 5"x16"
Flower cut width of fabric by 3"
back of pillow sham cut 2 pieces 10"x16"
Ruffle your width of fabric piece. Layer all the flannel pieces with their corresponding cotton fabric for the top. Sew the ruffled piece of fabric down, onto the square. Using the shorter rectangles, sew them to the sides of your square using a 1/2 inch seam allowance. You will be sewing through 4 layers of fabric at this time and the flannel pieces will be back to back with the cotton fabric pieces on the top and the bottom with the right sides facing out. Then sew the longer rectangles onto the top and the bottom of the pillow. Top stitch along one of the 16" edges of the pieces for the back of the pillow. Do it on both pieces. Lay your pillow front down, right side facing down, and place and pin your 10"x16" pieces in place. You will be creating an envelope back, so the 2 pieces will be overlapping a few inches. Sew around the outside edge of the pillow using a 1/2 inch seam allowance. Wash your pillow and dry it.